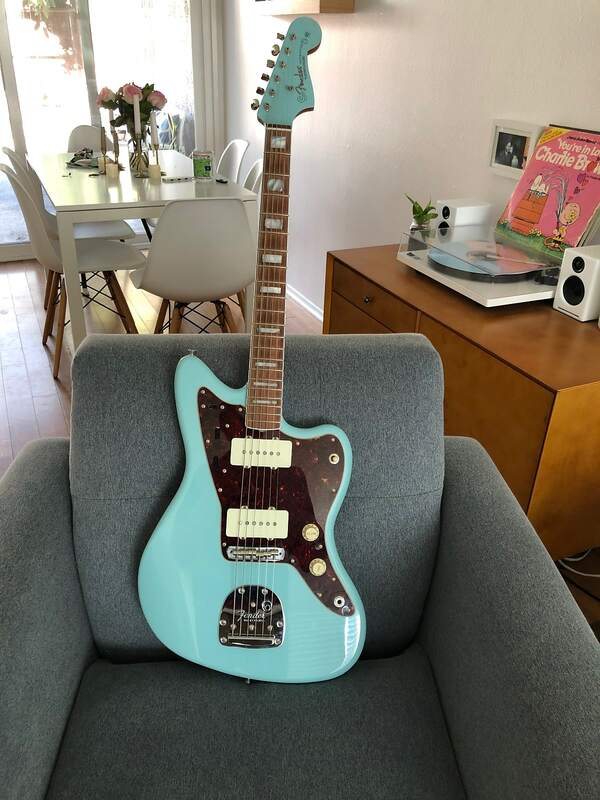 FDP Forum / Fender Guitars: Jaguars & Jazzmasters / Kurt Cobain Jaguar Question! Yesterday I happened upon a really nice, MIM, Kurt Cobain Jaguar. After reading up on it when I got home, I understand why there was a lot of distortion in the pickup (particularly the Bridge). My situation is this: I always play clean. Has anyone bothered to swap out humbuckers on this model in an effort to go clean? If so, what pups did you pick and how did they work out? Like most of the Fender MIM's I've played, this one really rocks. LOVE the neck! My friend replaced his Jaguar pickups with Joe Bardens. That's his favorite pickup and uses them in most of his guitars. His guitar sounds great. He also replaced the three switches with a Johnny Marr type blade pickup selector. I've also wondered if the humbucker equpped Jags could be converted to more traditional units by just replacing the pickups with something like AVRI Jag pickups. I'm no tech by any means but it would seem to me that as long as the pickup cavities are the same I would think that it would be a simple swap. I always play clean and absolutely love the tone that I get from the Bare Knuckle pickups in my Johnny Marr Jag from all of the positions. I hadn't considered replacing the humbuckers with single coils. I'll call my techie and see what would be up with that. This guitar just has a neck that is PERFECT for me and I love the shorter scale as my aging hands tend to not enjoy stretching as much. Hey 6, Try the GFS P90s that fit in a humbucker space. I put a pair in an Epi Wilshire and I'm very pleased. Now one of my go to surf axes. It's a drop in replacement. No routing required. If you want to feel a nice neck find a Fender Offset Special. This comes with stacked JM sized HBs. I have Duncan Vintage JM in mine. The guitars are also very light as they are thinlines with an F hole. "The guitars are also very light as they are thinlines with an F hole..."
I went back and played the Jag but realized it was just too heavy for me (must weigh 10lbs or so). I've decided to pass on it. 6, Here is a link to an ebay auction that shows the Offset Special. They built these in vintage sunburst, black and shell pink. My guitar is sunburst. The guitar was actually just fine and very bluesy with the stock PUs. I wanted a bit more of a JM tome from it so I swapped PUs. It still plays the blues just fine. With the offset Strat style body it is very comfortable to play. Again very light weight. Scale length is standard Strat at 25 1/2" so if your looking for a 24" scale Jag this won't be a good choice. I do like the neck on this model, just a little chubby, not too thick and not too thin. The vintage tint makes it a real looker. When I play it out I'm always asked questions about it as it is rater unusual. Yea, some of the Jaguars can get stupid heavy. My MIM CP isn't ten pounds but it's as heavy as my Bass VI (and feels moreso because it's smaller). Neck though is worth every effort. Routing won't be typical Jaguar on any of the HH guitars though, so you'd have to do work to put single coils in there. I have coil blend on mine so it's a happy medium. "Hey 6, Try the GFS P90s that fit in a humbucker space. I put a pair in an Epi Wilshire and I'm very pleased." I just dropped a Dream 90 into the neck slot of a Telecaster - really nice pickup!! Fender 60th Anniversary Classic Jazzmaster Electric Guitar - Daphne Blue. Has anyone had enough exposure to this model to know if it needs any of the old school mods, so it will stay in tune and play right?? They sound great! I wouldn't expect issues if it's set up competently and there's nothing wrong with it. For all the hullabaloo about replacing this and that on Fender offsets that the net is agog over...if I can get a stock, nothing changed but the control knobs (cosmetic) Squier Bass VI to intonate properly enough that it works with my guitar synth....the Mexican stuff will too. I have a MIM Jaguar HH that also passes the guitar synth test and is my standard guitar synth guitar and has been for almost a decade!